"UPS" egg while Chris held the winning "#2" egg. For as long as I can remember we've cracked or "shucked" eggs at Easter Dinner. We would say, "Christos Anesti" (Christ Is Risen) followed by "Alithos Anesti" (Truly He Is Risen) before hitting eggs with one another. Being as competitive as I am and with Easter Sunday typically falling around March Madness I found that it made perfect sense to create an Egg Brackets. 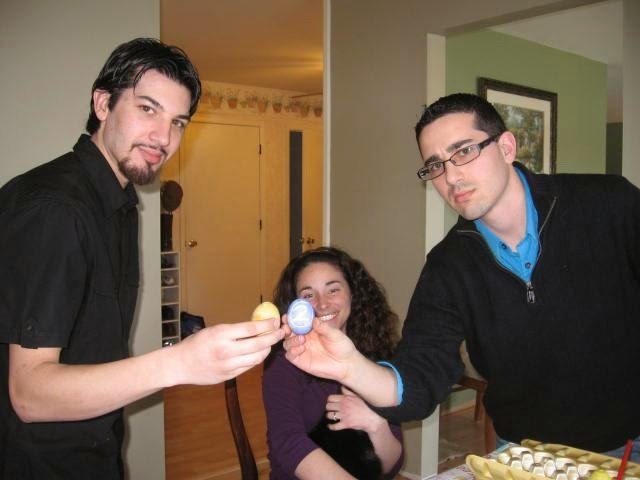 In 2009, the annual Egg Beaters Tournament was born. Chalk up another victory for those "defense wins championships" people. 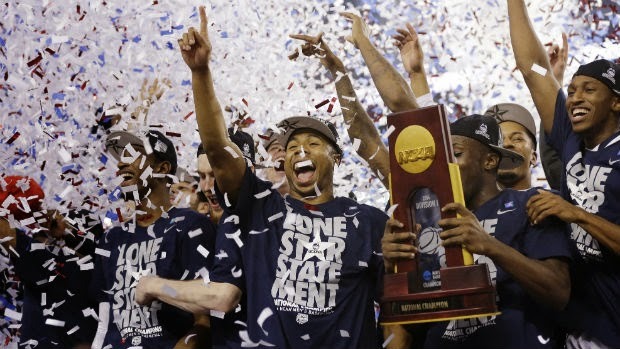 Led by scrappy guard play on both ends of the floor the 7th-seeded Huskies defeated the 8th-seeded Wildcats for the 2014 NCAA National Championship. 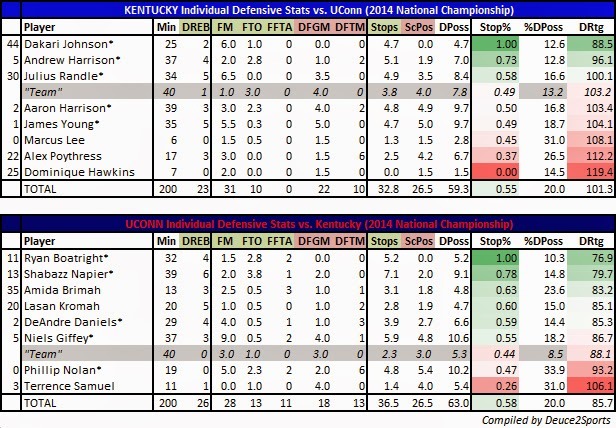 This was the third game in a row I charted both UConn's and Kentucky's defense. And for the third straight game the Huskies' defensive numbers were off the charts while Kentucky proved it was trying (or only could) win via its offense. In the end the defense prevailed thanks to a pair of incredible defensive performances by Ryan Boatright and Shabazz Napier. It's been a magical ride for the Wildcats. While the team has all the talent in the world, it can't be argued that luck has been on Kentucky's side for much of this NCAA Tournament ride. 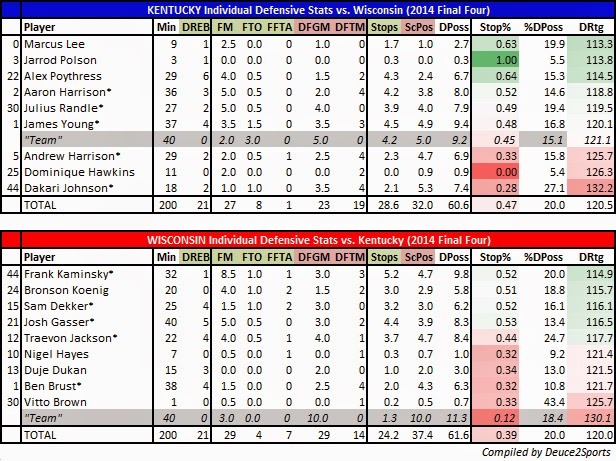 Skill plays into it, no doubt, but Kentucky's eFG% (52.6) is actually worse that it's opponents' eFG% (53.1). Yet, Kentucky is 5-0 in tournament play with all victories coming in single digits. Oh, Aaron Harrison has a lot to do with it. Harrison hit another game-winning 3-pointer - his third in as many games - to beat Wisconsin. His dagger with 5.7 seconds to play helped atone for his twin brother's gaff of fouling a 3-point shooter that allowed Wisconsin to take a 73-71 lead in the waning seconds. What's amazing is Kentucky is getting here, in all reality, riding its offense. 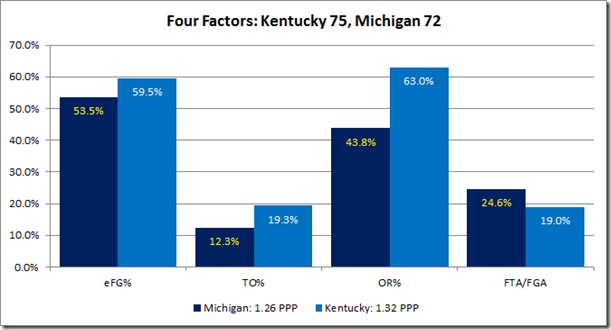 It's NCAA Tournament offensive efficiency is around 1.17 PPP; it's opponents are at 1.11 PPP. 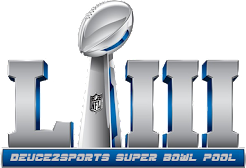 This makes for truly exciting games but it leads you to believe the Wildcats could be susceptible to a team with ferocious defensive prowess. 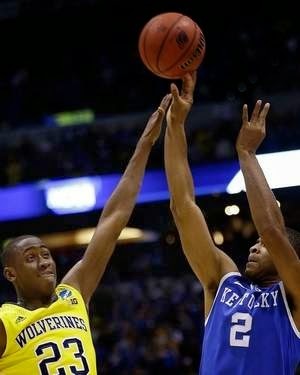 Of course, Wichita State and Louisville were those types of teams and Kentucky marched on. 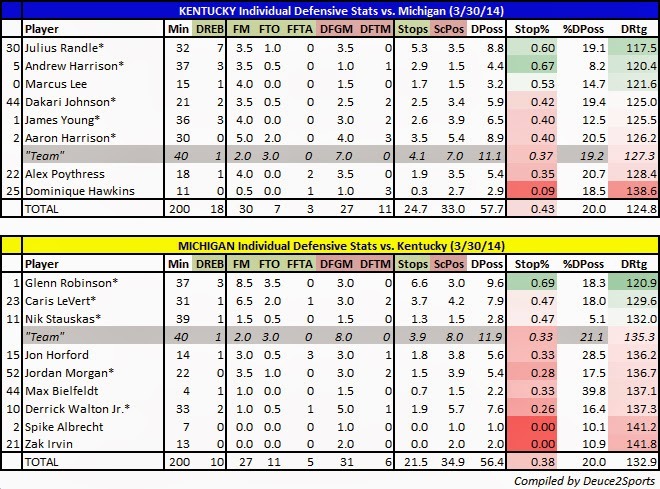 For reference, here's Kentucky's Defensive Score Sheet from it's Elite Eight win over Michigan. Those scrappy dogs won't let up. Led by its harassing defense, UConn absolutely frazzled a national championship favorite and now finds itself just 40 minutes away from a national title. 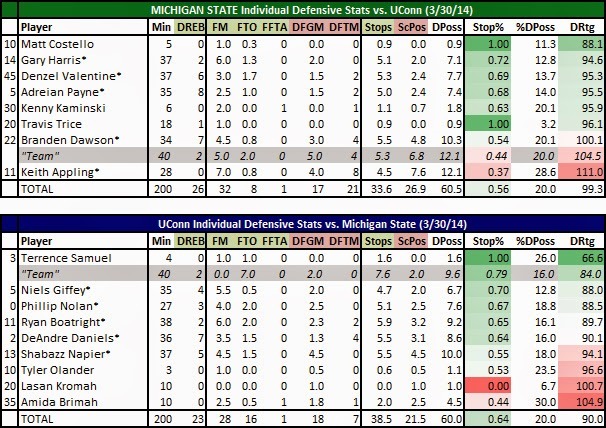 For those who thought UConn's 60-54 win against Michigan State was a fluke this game proves just how good the Huskies are playing right now on the defensive end. Surrendering an average of 53.5 points to two extremely good offenses, highlighted by completely taking the point guard out of the game, has been a clinic and a pleasure to watch for defensive purists. Here's the Defensive Score Sheet from UConn's 63-53 win, giving the Huskies their second finals appearance in four seasons, their third Final Four in six years and a chance at their fourth national championship since 1999. 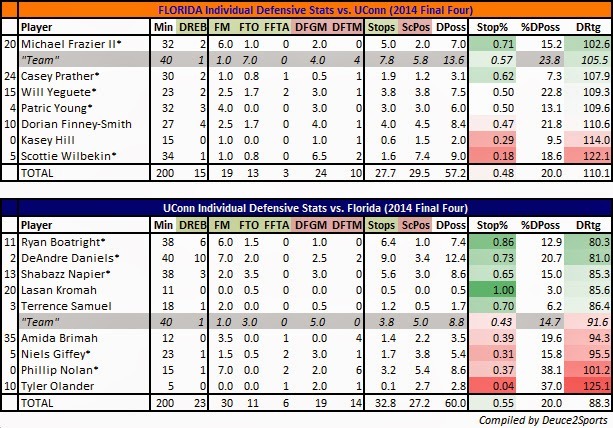 For reference, here's UConn's defensive dirty work against Michigan State in the Elite Eight. In the game of the 2014 NCAA Tournament (so far), Kentucky's Aaron Harrison hit a game-winning 3-pointer with 2.6 seconds to play to send the Wildcats to their third Final Four in four seasons. The dagger - which became so when Nik Stauskas' half-court heave at the buzzer was off the mark - prevented Michigan from reaching the Final Four for the second straight season. The game was played at such a high level as teams traded buckets and went back-and-forth with mini runs. It was so well played that it's probably easy to forget how slow-paced the game actually was (57 possessions).